Ten awesome outfit ideas to sport for the week long Navratri celebrations! While the nation readies itself for the festival of Navratri, we would like to help you too in getting ready for the week long celebrations and more. It is a fact that there would be many rituals and gatherings to attend, and not to forget the fun times at the dandiya too; we thus bring to you chic and very desi Indian fashion statements to flaunt in ten ways while the Navratris are on! 1. Multi hued lehenga cholis: Ditch the heavily embroidered lehenga cholis when you are out partying with your besties at the dandiya bash, and wear a vibrant touch to grab eyeballs. Ethnic in its own ways, the gorgeous chiffon and cotton fabrics in multi warm toned hues makes for a resplendent ethnic touch at the dandiyas. 2. Embroidered lehenga sarees: For the very conservative rituals and the parties to attend, you would want to be cool yet ethnic at the gathering. Wear an embroidered lehenga saree in cool tones- purples, blues, greens or pale pinks, with heavy embroidery done on the choli and the odhni. 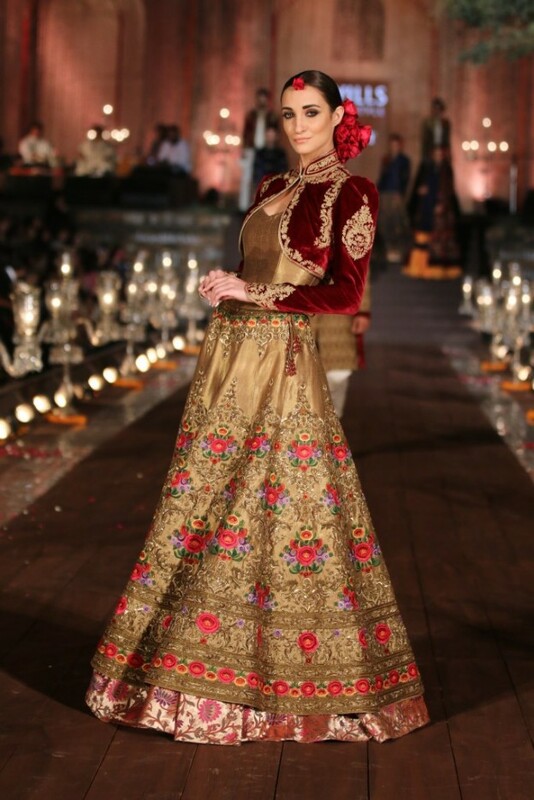 The long flowy sheer lehenga skirt balances the look with minimal ethnic work done on the flare and the border. 3. 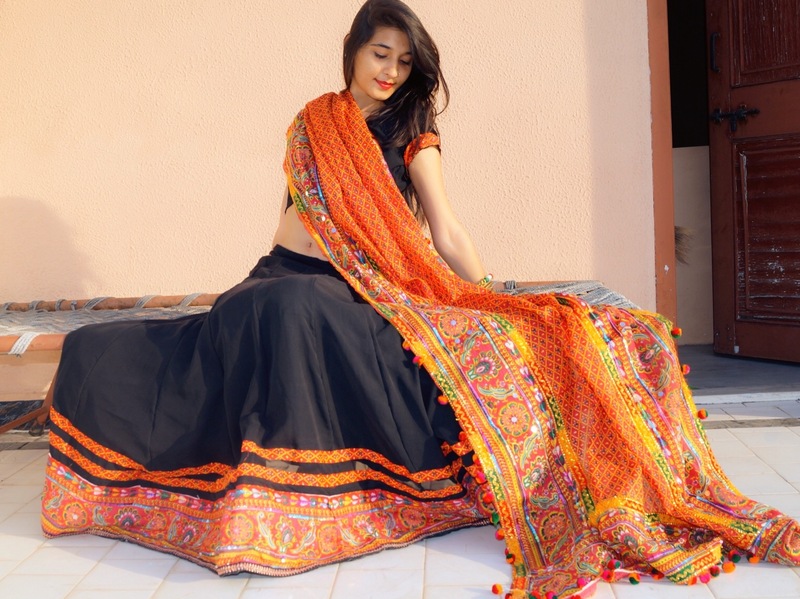 Mirror worked Rajasthani dupattas on lehengas: Black and orange cotton lehenga cholis can be worn to the navratri bash, provided you balance and complete the look with a dupatta heavily embossed in Rajasthani artwork and mirror patches; tassels on the fabric makes a haute touch and statement too. 4. 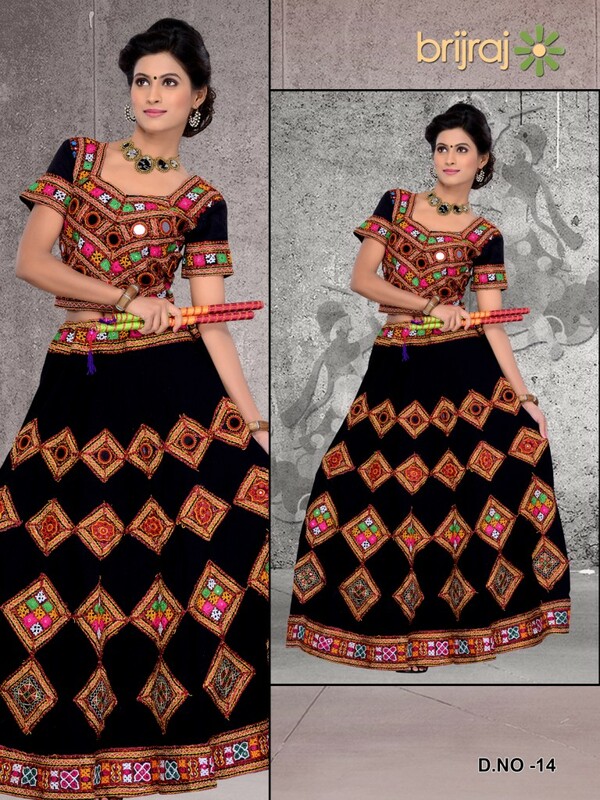 Designed to finesse chaniya cholis: Chaniya cholis have always be the norm with PYTs dressing up like divas for the navratri festival. This time though, with midnight blue velvet long flowing skirts paired with gold cholis and golden-red dupattas to grace the occasion with, the look comes as chic and balanced. Complete the look wearing mojaris for the feet should you be dancing all night round, or else heels would be an ideal pair to wear! 5. Gamthi chaniya cholis for a stunning look: All things traditional and ethnic – if that is what you want, the gamthi chaniya choli then is a stunner to flaunt at the Navratris this time. Vibrant hand embroidered and with full flare that too, the gamthi chaniya choli with a heavy georgette dupatta is a traditional look that would gather compliments for you. 6. Polka dotted royal ethnic looks: Dazzle the nighttime parties and the dinner gatherings at the Navratris wearing a black and gold polka dotted with a pink border chaniya choli. Complete the look with a statement neck piece and a gorgeous maang tikka in gold. 7. Magenta net silk lehenga cholis: Cool tones for the evening gathering makes for a splendid look and with heavy embroidery done at the sleeves and the flare of the lehenga skirt, the stones shine in the dark and create a magical touch for the festive spirit. Accessorize the hair with a gorgeous passa or a maang tikka. 8. A-line lehenga cholis for the dandiya night: Zardozi embossed, the A-line lehenga choli for the dandiya night in neutral tones with embroidery in chocolate browns can be a fashion statement to behold. Grab more than just eyeballs at the dandiya wearing the zari work A-line lehenga with heels and heavy kundan statement neck piece. 9. Lacey lehengas in red for the navratri nights: Red is a color or hue resplendent with emotions, love, passion, romance and power, which is why wearing a lacey red lehenga with gold embroidered patterns on the blouse, the dupatta and the flare of the lehenga skirt, makes for a haute touch at the Navratri gatherings. 10. A hand-crafted lehenga with short jacket: Quite ethnic with a modern twist, the hand-crafted lehenga with short jacket with traditional embroidery done on the skirt in gold and floral hues with a velvet cropped jacket hand crafted is an ideal haute statement to wear and flaunt. Enjoy your Navratris in style! Do let us know your style secrets too!